College of the Ozarks sustained minor damage from last night’s storm, limited to a few downed trees and tree limbs. However the campus phone service has been interrupted due to the storm damage to the Branson area at large. Currently, the most effective way to reach staff, faculty and students is by e-mail or cell phone. The College family sends prayers to those in the area who were affected by the storm. Branson, Mo. – Myer Hotels, Branson’s Award-Winning Hotels Company, confirmed that five of their six hotels in Branson received no damage. Only one hotel sustained damage, and there were non injuries at any of the properties. The BEST WESTERN Center Pointe Inn located on Highway 76 received moderate damage to one building and light damage to two other buildings. “Our staff did an excellent job of alerting guests about the situation and this helped to keep them safe. No one was hurt. We were able to move all of our guests to our other hotels after the storm passed,” said Chris Myer, Vice President of Marketing for Myer Hotels. The cleanup process and assessment have already begun. Contractors and clean up crews were already on hand first thing Friday morning at the BEST WESTERN Center Pointe Inn. Myer Hotels has taken a proactive approach to crisis situations with pre-planning for these types of situation. “You hope you don’t have to use these plans but it is great to have plans in place something like this happens,” said Myer. “It’s important for visitors to know that they can still come to Branson and have a great vacation. Many of Branson’s most popular attractions were untouched and plan to open up. The shows will go on,” said Myer. The BEST WESTERN Center Pointe Inn has long been a favorite of Branson visitors due to its outstanding location right in the heart of Branson’s entertainment. The hotel will reopen and be better then ever. 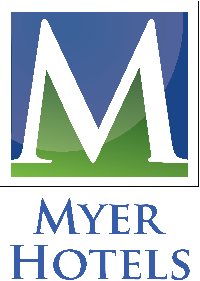 You can visit Myer Hotels at www.myerhotels.com. 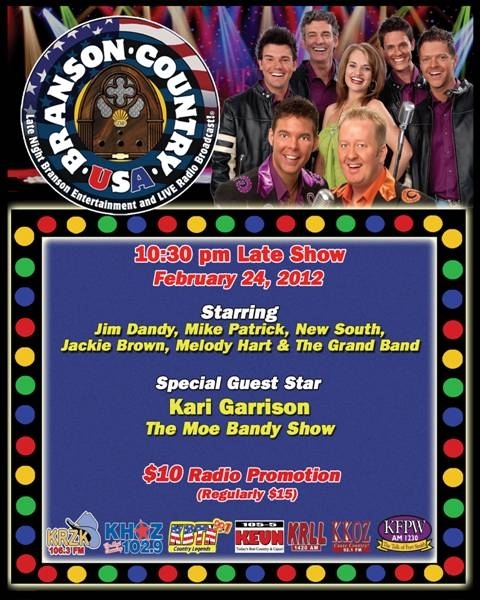 Grammy award winning entertainer and popular Branson performer, James Garrett, guest stars on Season 6 of TLC’s reality show, 19 Kids and Counting, airing this Tuesday, February 28, 2012. In the episode titled ‘Music with the Duggars,’ the Duggars head to Branson, Missouri for a speaking engagement and musical performance in the Little Opry Theatre. Focusing on cousin Amy Duggar’s budding music career, James is featured as a long time friend of the Duggar family helping to launch Amy’s career. Performing on stage for over 35 years, James picked up his first guitar at the age of four, after listening to Elvis Presley sing in the movie Loving You. Moving to Texas at age 11, he began singing gospel music in church. His professional singing career began as lead singer for a bluegrass group at Dogpatch USA, near Harrison, Arkansas, followed by regular performances at Silver Dollar City. Highlights in James’ career include winning a Grammy with country music group The Kendalls, and performing with many of his idols, including John Denver. James currently headlines two separate live shows at the Little Opry Theatre inside Branson’s IMAX Entertainment Complex: A Tribute to John Denver and The Johnny Cash Songbook, debuting in March. The Ralph Foster Museum at College of the Ozarks will feature a special exhibit for the 100th anniversary of the Girl Scouts beginning March 12, the official Girl Scouts anniversary day. 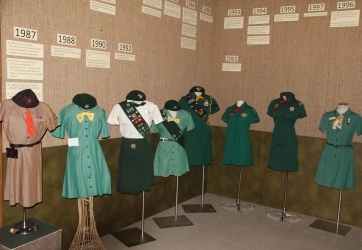 The exhibit will display Girl Scout uniforms, patches and booklets throughout history. The exhibit will be on display at the Edwards Art Gallery, located on the first floor of the Ralph Foster Museum. The Ralph Foster Museum is open Monday through Saturday from 9 a.m.-4:30 p.m. Admission is free for high school and younger, adults are $6, and senior citizens are $5. For more information, please contact Annette Sain at 417-690-3407.
jackson+appleton takes BEST IN SHOW! Pictured are Robin Jackson and Nicholas Appleton accepting the Best in Show Award. Branson-based video production company, jackson+appleton, took home the evening’s Top Award on Saturday night at the 33nd Annual ADDY® Awards in Springfield, Missouri. jackson+appleton won the prestigious BEST IN SHOW Multimedia Award for “We’re Debt Free,” a promotional video produced for College of the Ozarks. In addition to BEST IN SHOW, the production team won 4 GOLD ADDY Awards and 5 SILVER ADDY Awards. 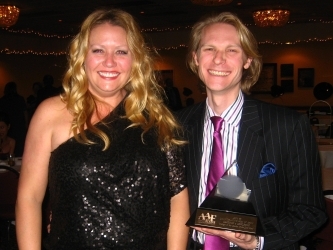 The ADDY Awards are hosted by the AAF of the Ozarks, an affiliate of the American Advertising Federation. Annually, the American Advertising Federation conducts the world’s largest advertising competition through its 200 member advertising clubs. The local awards are entered and attended by Advertising Agencies, Television Stations and Production Companies from Southwest Missouri and Northern Arkansas. In the Video Sales Presentation category, jackson+appleton brought home two GOLD ADDY Awards for videos produced for College of the Ozarks. “We’re Debt Free” showcases the Debt Free Education Program at the College, and “We are College of the Ozarks” is a promotional video produced for the President George W. Bush visit. “We are College of the Ozarks” additionally took home a Gold ADDY for Best Cinematography and a Silver ADDY in the Commercial Category. Two videos featuring jackson+appleton’s international work were also honored. “Cooperative Spirit Shines in Haiti,” a documentary for White River Valley Electric Cooperative, won a Gold ADDY in the Webisode Category. A Fundraising video campaign for Convoy of Hope was also honored with a Silver ADDY in the Public Service Campaign Category. An internet commercial promoting the new Aloha River at Silver Dollar City’s White Water won a Silver ADDY. The Showboat Branson Belle’s pre-show Welcome Video also took home a Silver ADDY in the Out-of-Home Advertising Category. Finally, a commercial for Sight & Sound Theatre’s “Noah” won a Silver ADDY in the Advertising for the Arts Category. Owned by Robin Jackson and Nicholas Appleton, jackson+appleton is a full service HD production agency serving Branson and beyond. Winning videos projects may be viewed at www.youtube.com/jacksonappleton. The Department of Defense issued the Seven Seals Award to Branson resident and legendary entertainer Tony Orlando for the work he does in the United States, as well as overseas, in supporting National Guard and Reserve members. Orlando frequently visits and entertains troops in Iraq and Afghanistan, and performs countless shows for military personnel and their families in the United States. For 18 years he has hosted “Tony Orlando’s Yellow Ribbon Salute To the Veterans” in Branson MO on Veteran’s Day: a free show to all veterans who attend the Branson Veterans Homecoming, America’s largest veteran’s day celebration. New Jersey Air National Guard Chief of Joint Staff, Brigadier General James J. Grant, and Department of Defense State Vice Chair Don Tretola presented Orlando with the award at The Borgata Hotel in Atlantic City, New Jersey. Tony Orlando will return to Branson November 1, 2012 to star in “Tony Orlando’s Great American Christmas” at The Welk Resort Theatre. Titanic Museum Attractions is hosting “A Night to Remember: An Original Musical Tribute to Titanic,” on Saturday, April 14, the 100th anniversary of the night the ship struck an iceberg on its maiden voyage. Musical performances, historic ceremonies and appearances by actual descendants of Titanic’s passengers and crew will highlight the production honoring the 2,208 people aboard the ship. 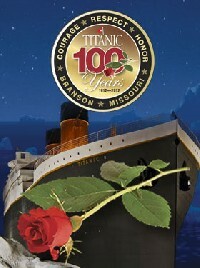 The musical tribute will begin at noon (Central) on April 14 at the Titanic Museum Attraction in Branson. Three Dog Night has been rocking the charts for more than 40 years. On Saturday, July 14, 2012 they will bring their legendary rock style to The Mansion Theatre for one night only. From 1969-1974, nobody had more Top 10 hits, moved more records, or sold more concert tickets. In 2011 THREE DOG NIGHT continued to top the list of artists with the best Billboard Top 100 Chart average! music on iTunes as well as at record stores. In fact, their releases from this decade alone have sold over a million copies. On websites such as Facebook, Myspace, Last.fm, iLike, and ReverbNation, THREE DOG NIGHT have garnered millions of music plays. Recently, Three Dog Night began adding new songs to their arsenal by releasing their first double-A sided single in nearly 25 years. The blistering performance of “Heart Of Blues” and the timely, beautiful a-cappella ballad “Prayer of the Children” are available exclusively online through the official band website (www.threedognight.com) as well as Facebook and MySpace sites. THREE DOG NIGHT also pushed boundaries by recording with the London Symphony Orchestra, giving fans new and old a chance to experience their dynamic performances of the hits as well as several new songs. The project, recorded at the famous Abbey Road studios in London and released to coincide with the band’s 35th Anniversary, added exciting new orchestral arrangements to THREE DOG NIGHT’s signature sound. THREE DOG NIGHT maintain an aggressive, year-round touring schedule of over 80 dates a year. Their well-loved hits plus some amazing new songs are performed for audiences spanning generations, by founding members Cory Wells and Danny Hutton on lead vocals, as well as original keyboardist Jimmy Greenspoon and guitarist Michael Allsup. Paul Kingery (bass and vocals) and Pat Bautz (drums) complete the lineup. Originally formed in 1968, the group was enormously successful from the start. Danny Hutton, who was a writer/producer at Hanna Barbera Records as well as a solo artist, met Cory Wells, lead singer of The Enemys which was the house band at the Whisky A Go-Go, while they were both touring with Sonny and Cher. The now-famous name came from a magazine article about Australian hunters in the outback who curled up with their dogs for warmth on cold nights; the coldest being “three dog nights”. Boasting chart and sales records that are virtually unmatched in popular music, THREE DOG NIGHT had 21 consecutive Top 40 hits, including 3 #1 singles, 11 Top 10’s, 18 straight Top 20’s, 7 million-selling singles and 12 straight RIAA Certified Gold LPs. Their hits appeared on best selling charts in all genres (pop, rock and country). THREE DOG NIGHT recorded the music of the best (and mostly undiscovered) new songwriters of their time including Harry Nilsson, Randy Newman, Elton John, Laura Nyro, Paul Williams and Hoyt Axton among many others. The group’s eclectic taste, combined with their ability to recognize and record hits in a unique, distinctive and appealing style, resulted in THREE DOG NIGHT dominating the charts for years. Now, as they mark 40 years on the road, THREE DOG NIGHT continues to grow their fan base and develop new ways of doing business.